After moving dangerously close to the tipping point on Tuesday, the market got something of a reprieve with Wednesday’s action. 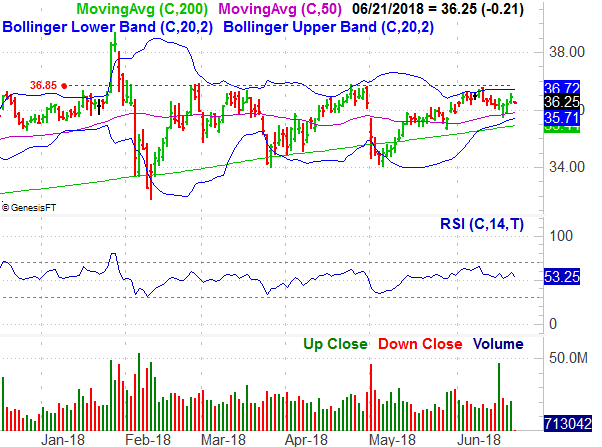 FANG stocks Facebook (NASDAQ:FB) and Netflix (NASDAQ:NFLX) both moved to record highs yesterday, pulling the rest of the market up with them. That rally has already been quelled though, with stocks back in the red in Thursday’s action. We’re toying with the “June swoon” after all, which usually doesn’t materialize until the latter half of the month anyway. Today’s top three prospects boast charts that are more likely to do their own thing than rather than ride the market’s tide, however. Those are JPMorgan Chase (NYSE:JPM), Pfizer (NYSE:PFE) and Disney (NYSE:DIS). The fundamental case for owning JPMorgan Chase is healthy enough. 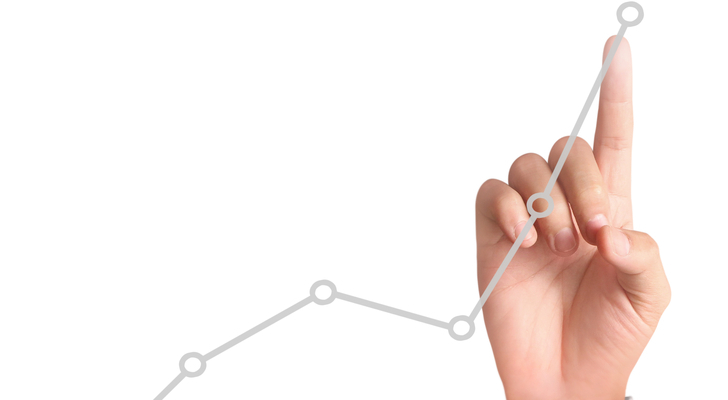 Revenue and earnings have been growing, and are expected to continue doing so this year and next. Rising interest rates in a fast-growing economy are ideal for it and its banking peers, and a P/E in the teens is a reasonable price to pay for quality like this. Nevertheless, traders are showing an increasing degree of doubt in the stock’s foreseeable future. A little more of this “doubt,” and JPM shares could find themselves on the wrong side of a key support level, with nothing left to prop them up. That support level is, give or take, around $106.00, where the 200-day moving average line is, as is the lower boundary of a converging wedge pattern that started to take shape with February’s peak. 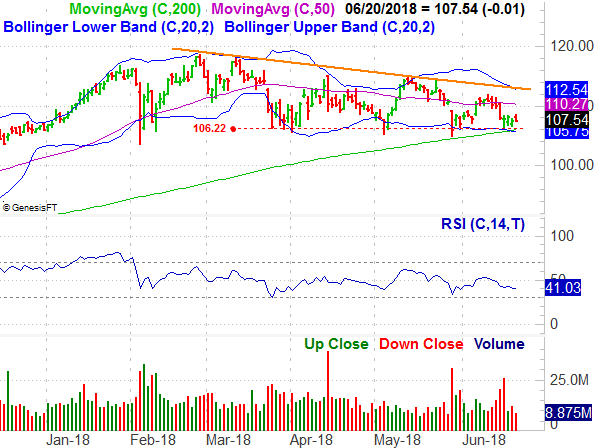 That wedge shape, with the upper boundary tagging the descending lows since then, is guiding JPMorgan Chase to a showdown at the floor made up of several converging support lines, including the lower 20-day Bollinger band. 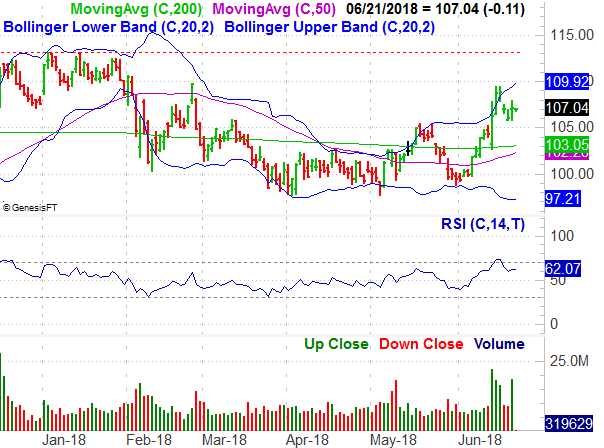 The rally in question now got started back in early 2016 with a push off from support at $50.00, although it’s unlikely the stock will revisit that low. A more plausible downside target should the breakdown materialize is closer to $92.00, near where shares broke through another (albeit minor) resistance area in a year ago. 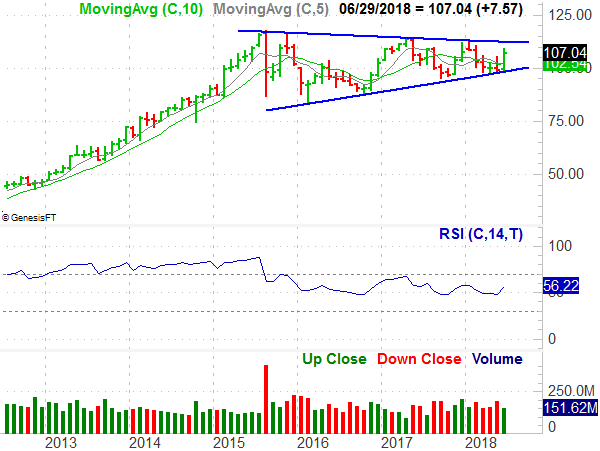 JPMorgan Chase isn’t the only name slowly but surely being forced into the tip of a wedge pattern, forcing traders to make a decision, and likely forcing an explosive move in the process. Pfizer is going through the same process right now… just in the other direction. That is to say, PFE stock is knocking on the door of a bullish breakout. Pfizer has struggled with a technical ceiling around $36.85 since February. But, it’s made a string of higher lows that whole time, keeping it in good position for a breakout thrust. The chart is also “spring loaded” in the sense that several key moving averages have converged around $35.70. In that moving average lines cycle through convergent and divergent patterns, we’re now looking for a new divergence to take shape. 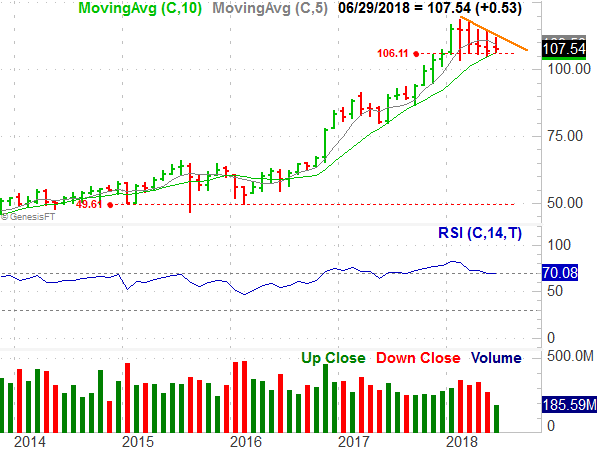 A move above the near-term ceiling at $36.85 is apt to rekindle the long-term uptrend that’s been rather well-defined on the monthly chart by rising support and resistance. The upper boundary of that rising trading range is currently at $40.00, though it moves a little higher every week. Finally, though a superficial, straightforward analysis of the situation would suggest that the last thing Disney shareholders want to see is a bidding war with Comcast (NASDAQ:CMCSA) for Twenty-First Century Fox Inc (NASDAQ:FOXA), investors appear to be cheering the idea. 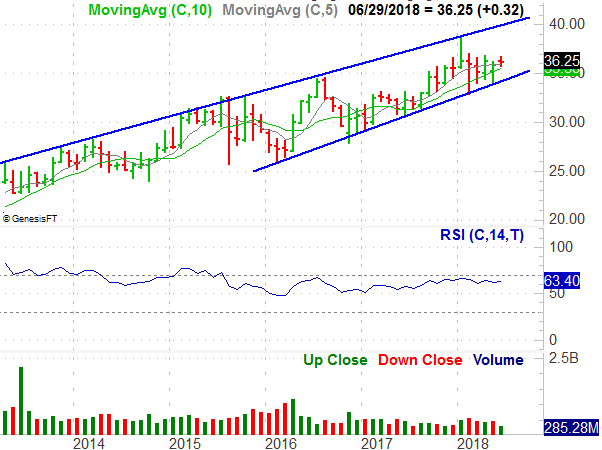 The higher-volume rallies on the news of its raised bid implies Fox would be a growth-driving asset rather than just another expense for the media giant. The key here is the tall volume bars seen immediately following reports that AT&T Inc. (NYSE:T) would be allowed to acquire Time Warner, clearing out any likely legal impediments for AT&T, and then another volume surge behind the gain made in response to news that Disney just outbid Comcast on Wednesday. By sheer coincidence, this bullish thrust also seems to be framed by yet-another converging wedge shape evident on the monthly chart. The fact that DIS stock hasn’t made any net progress since 2015 sets the stage for a prolonged move, if only because investors think it’s been held in purgatory long enough. While the longer-term potential upside target is above this mark, the January high of around $113 would be a good place to reassess the strength of any rally that might materialize in the meantime. As of this writing, James Brumley did hold a position in AT&T. You can follow him on Twitter, at @jbrumley. Article printed from InvestorPlace Media, https://investorplace.com/2018/06/3-big-stock-charts-for-thursday-jpmorgan-chase-pfizer-and-disney/.